Only 1 Box Left. Butterfinger hearts are the same great crispy, crunchy peanut butter candy covered in a delicious milk chocolate as a candy bar, however these are in a heart shape. These are a perfect Valentine Candy for anyone who loves butterfingers or old time candy bars. 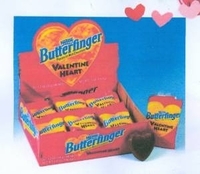 When trying to find just the perfect treat for your valentine consider the Butterfinger hearts instead of a heart shaped box of chocolates. Everyone loves butterfingers ! Each box has 24 1.2 oz candy hearts.